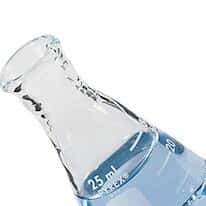 Erlenmeyer flasks have a flat-bottom design with a narrow neck. This design makes swirling liquids without spilling easier. These flasks also support many other lab processes including preparing microbial cultures. Erlenmeyer flasks are crafted of many different materials. Choose from polycarbonate, borosilicate glass, polypropylene, polyethylene terephthalate co-polyester plastic (PETG), perfluoroalkoxy (PFA), and more. Some models include caps.